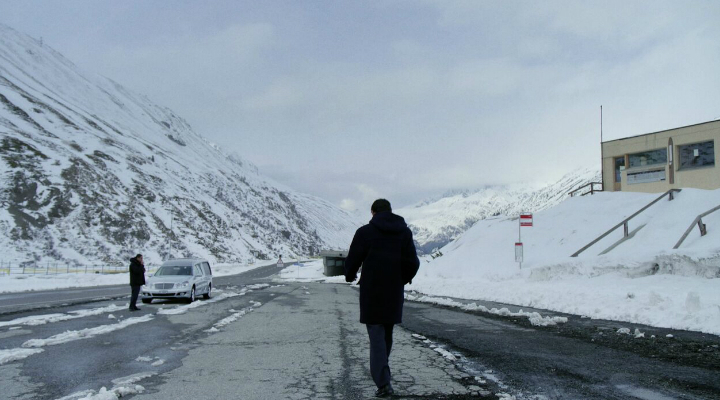 After the death of a Calabrian emigrant who came in Switzerland to find work, two undertakers, Jovan and José, who are themselves emigrants, travel from north to south of Italy to repatriate the dead body into his home village. “Calabria” is a metaphysical road movie in a hearse. Jovan, a gypsy who was singer in Belgrade, believes in life after death. While José, a Portuguese passionate about classical music, believes only what he sees. This trip is an opportunity to pay a tribute to the dead person and to enjoy life while death is lurking behind the back. Swiss director Pierre-François Sauter (b. 1966) was trained in arts – painting, sculpture and drawing. He spent his childhood in Mozambique, later lived in Lisbon, Paris, Brussels, Louisiana. Back to Switzerland, he worked in radio and television: in 1995 as a stage director in “Radio Télévision Belge” (RTB), during 1999-2004 he made more than 49 documentary portraits in “Schweizer Radio und Fernsehen” (SRF). Before devoting himself to film-making in 2003, Pierre-François Sauter participated as a graphic artist in various exhibitions. “Calabria” is his second feature film.